January is the best time to start getting organised for the year head. Planning your goals, setting achievable targets and starting the year off with a positive attitude. Sometimes though it is not always possible to get the motivation to get going, especially when you are still in the Christmas season slump, so we have put together a few tips to help you not only get yourself organised but to also keep yourself organised. Prioritise – At the beginning of every week set out the tasks that need completing and place them in order of importance as well as note the time needed to complete each task. This way if you have a few large important tasks you can organise your time better to complete them while also fitting in the little tasks. 2 Minute Rule – When you are determined to get a large job completed but keep getting distracted by incoming e-mails, social media notifications or something else try using the 2 minutes rule. If the distraction is going to take NO MORE than 2 minutes to deal with, then handle it. Longer than 2 minutes then make a quick note and deal with it later when you have more time free. Plan Ahead (as much as possible) – Especially with things such as social media, using software and apps such as Hootsuite you can organise your posts in advance so when working on a project or something unexpected comes up you know it is taken care of. This can also be done with your newsletters. Set up the layout and basic content and then when the more up to date such as link to blog posts come up you can quickly add them. 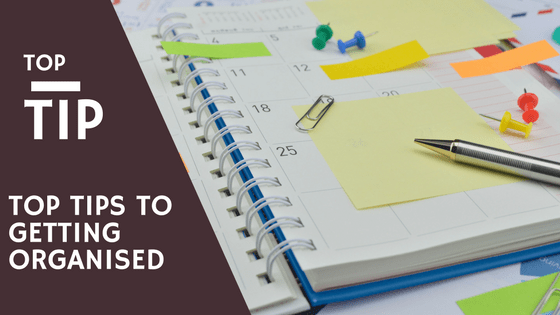 Same for blog posts, spend a Sunday afternoon typing up a few at a time and set their release dates in advance. Set a Goal – Brainstorm everything you want to achieve in the following month/quarter/year and pick one goal to reach. Once picked make a note in a notebook of everything you will need to accomplish that goal, including materials, time, collaborations with other business owners and anything else. Then keep checking it to see how far off you are from accomplishing that goal. Use a Diary – Only use it though for those jobs with a set deadline. Keep track of the important details and if using your phone set up reminders a week before hand and then 48 beforehand so you can prepare in advance. Brainwaves, reminders to call someone back, birthdays and little notes like that are better suited to a notebook/app rather than in the diary. Apps such as Gmail are brilliant in that they add any noticeable dates in your emails and add them to your diary if you have it synced. It can also link to your Google Now page adding all the information you will need. Work at your most productive time – When working for yourself you can pick when you want to work but its best to choose moments in the day you are at your most productive. If you are more focused in the morning put off that coffee date till the afternoon and get working, tasks can be completed far quicker when you are focused. Same if you are more focused in the afternoon, get your personal tasks done in the morning and focus on work in the afternoon. Label!!! – We do not always have time to file as and when we receive paper but if you create a ‘To file’ pile and tackle it every Sunday it can be dealt with easier. Label your files/diary entries/documents in a way that you can easily locate and pull the information you need. If you happen to handle documents for several clients or own a few businesses then colour code the files/Emails. Label hard and soft copies identically so you do not get them mixed up. Book in some down time – Working 24/7 can help you accomplish so much but it can also tire you out and ‘fry’ your brain. Set yourself a good routine for working and down time, even just a coffee every Monday morning or Friday afternoon. It can make the world of difference on your concentration levels and help improve productivity if you step back from it all for a short period. Too long a period and it will be hard to get back in to but the occasional afternoon or morning to focus on ‘You’ can work miracles. If you are struggling to get started this year and feel there must be better systems you could use to operate smoother then get in touch with RedRite and see how we can help. Available when you need us.